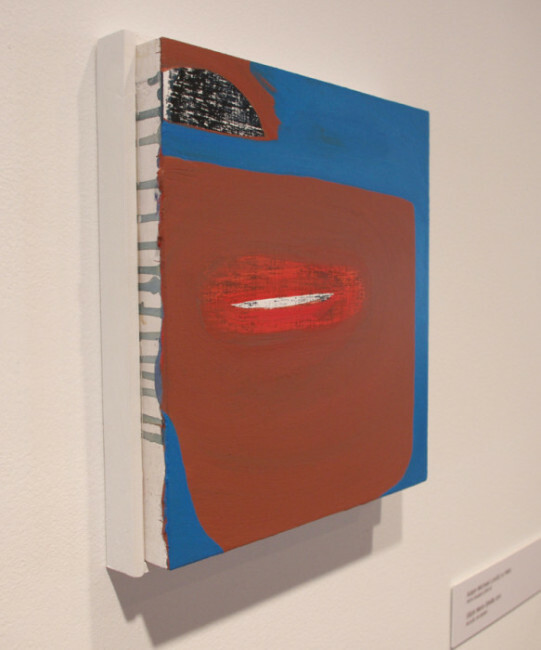 Who Say It Be at the Pennsylvania Academy of the Fine Arts (PAFA) showcases alumni Sarah Peoples and Adam Lovitz. Humorously aware of their artistic lineage, both artists effectively manipulate the past to reckon with the present. While they use found materials and installation in their practice, it is evident they are rooted in traditional art making as well. This combination of allegiances makes for a compelling, if not at times overwhelming, exhibition. The viewer is thrust into the past of America’s first art museum only to be abruptly propelled into the contemporary moment. 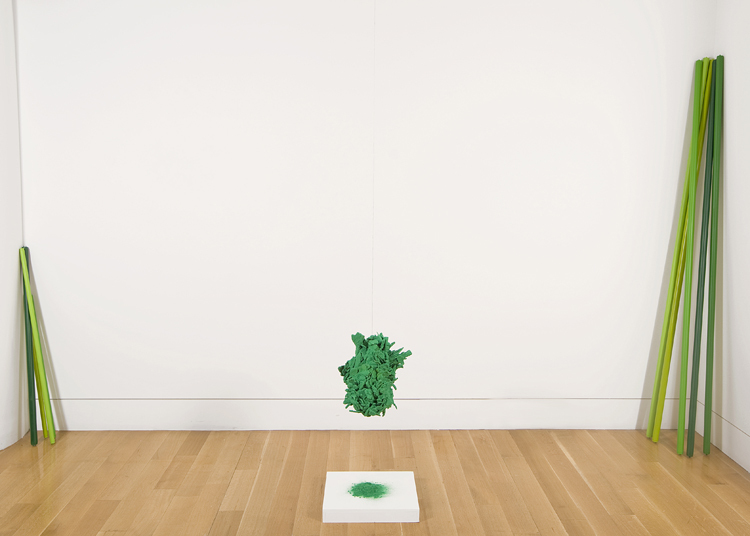 When the works succeed, their playful use of material creates a tension between art’s past and present to generate a contemporary conversation. Peoples’ work, rooted in sculpture, takes 2-D paintings and, with lighthearted flair, creates whimsical 3-D objects. 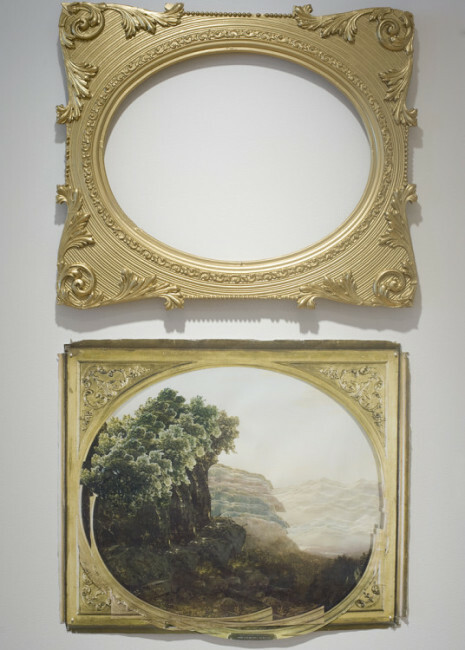 In particular, she uses the Academy’s own collection of Hudson River School landscape paintings, breathing new life and light into idyllic landscapes through the infiltration of silly and mundane objects. 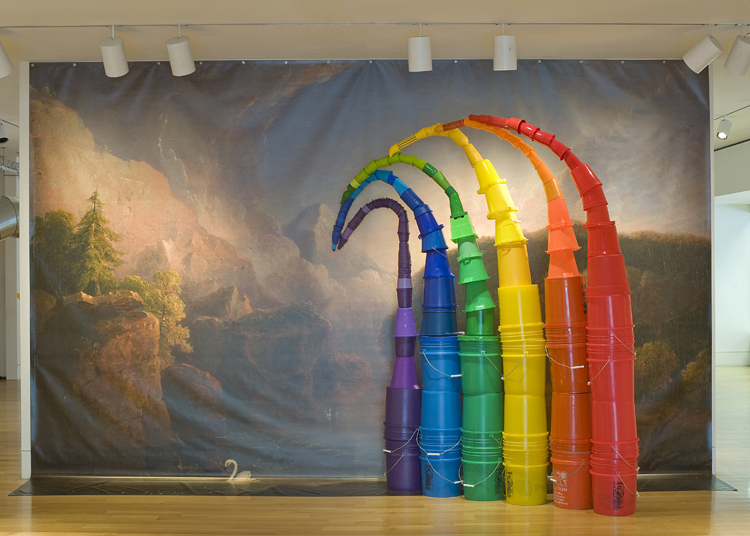 In Plastic Rainbow, Peoples enlarges Thomas Doughty’s Morning Among the Hills to monumental scale, effectively surrounding the viewer with the piece. She then projects Doughty’s painting from the wall through a rainbow of colorful plastic buckets. 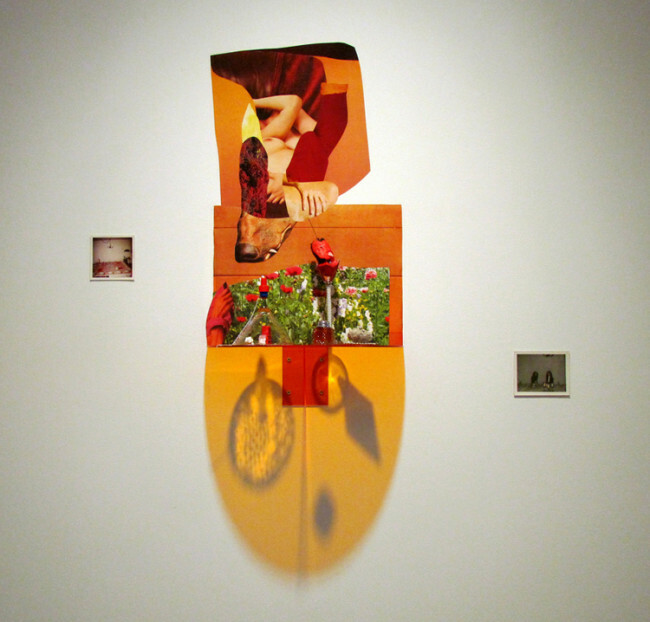 Other pieces from the museum’s collection are paired with handmade flourish-filled cardboard frames or turned into Dada-esque collages, such as An Earthquake. Sidestepping a strictly cynical approach to appropriation, Peoples’ sculptural infusions fancifully probe the history of the object’s creation while drawing attention away from the physical stains and cracks of the original pieces. Sarah Peoples’ artwork entices the viewer to reexamine historic images through a literal reframing. Her means may be satirical, with the use of kitten stickers and whirring record players, but the impressions and feelings evoked are much more complex and thought provoking. 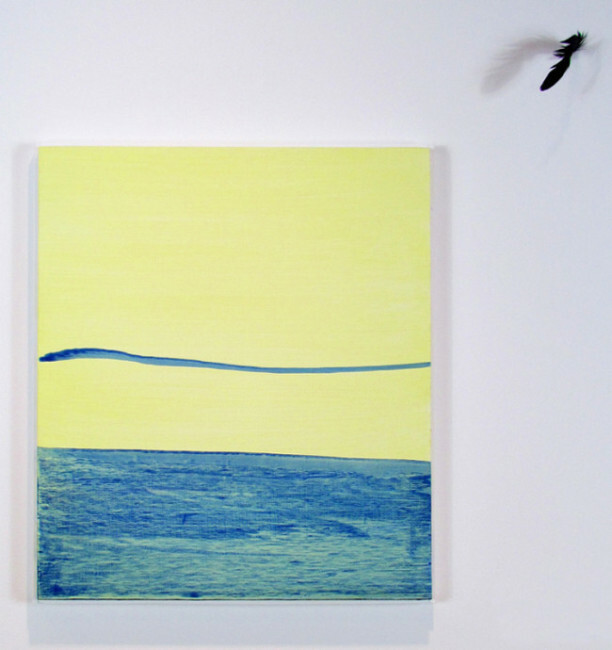 Adam Lovitz’s work, based in painting, tunnels in the opposite direction, inviting the viewer into materiality and then out into (interior) space. His pieces are mostly small, immediate, gestural movements housed in white stucco frames, like portals to an inner abstract landscape. Open Vent or South Philly Sun Shadow, Take Me To The Sea draw not from historically loaded imagery but rather from a surrealist re-imagining of mundane moments. Lovitz’s other exhibited works include 3-D collages made of found objects from his everyday life alongside paper cut-outs and polaroids. 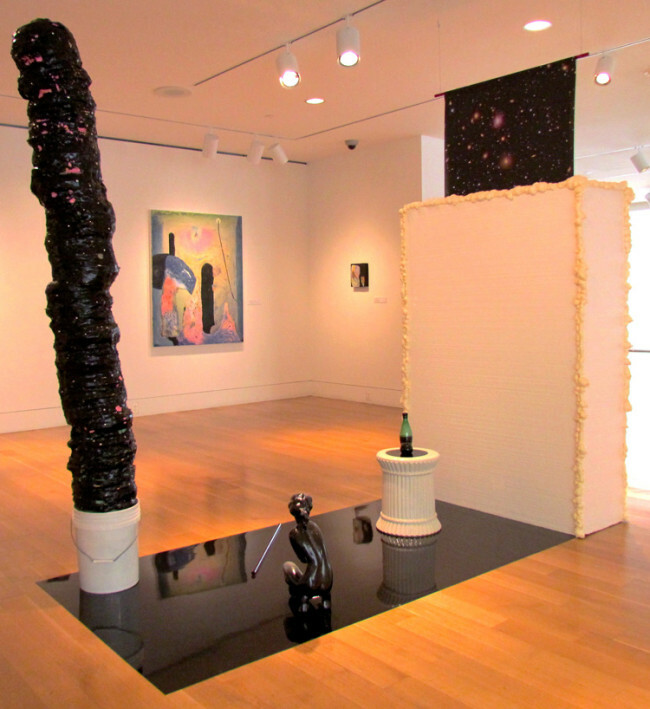 His impressive installation, Star Stuff, is comprised of crude substances such as Styrofoam, juxtaposed with introspective statues and the iconic Google image of the universe. Lovitz masterfully melds Carl Sagan’s famous quote “We are all made of Star Stuff” in his pairing of the domestic with the galactic: the two compounded into one image. Sagan’s quote evokes the connecting thread between our bodies and even the most distant nebula, and this equalizing runs through all of Who Say It Be. When the works remind us of the importance of moments like a familiar whistle echoing through a metal pipe or a shadow made by an overturned martini glass, they encourage a closer and better examination of our present. 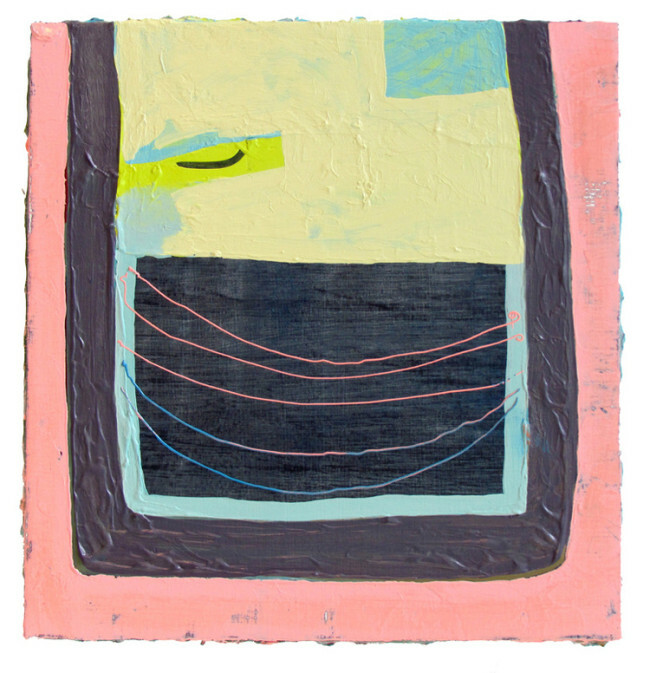 Abby King is a mixed media artist based in Philadelphia. She received her BFA in Painting and Photography from Xavier University in Cincinnati, Ohio, and completed her MFA at the Pennsylvania Academy of Fine Art in 2013.